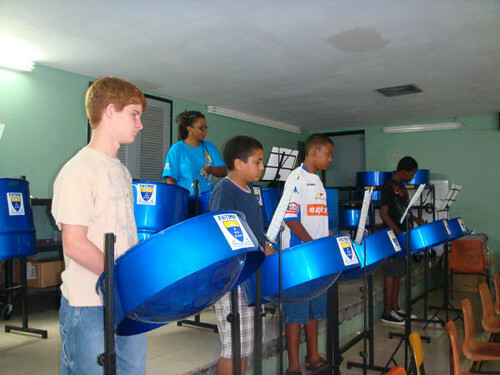 Fatima College now has its own Steelband Ensemble consisting of 10 different instruments. We are under the wonderful directorship of Ms. Michele Nicholas. Our group has performed at the Music Festival 2010, Gifts of Blue and Gold Concerts- 2009 and 2010 and also entertained the Graduates and their parents at graduation 2010. We are now preparing for this year’s graduation and recital. 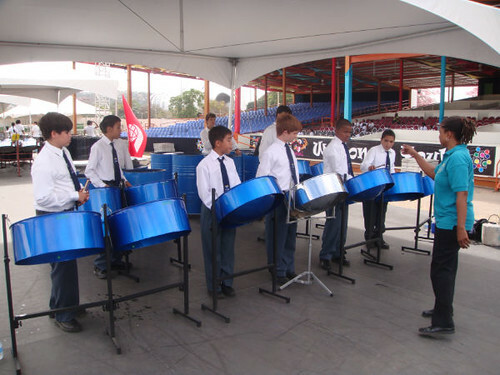 My musical journey began during the July/August vacation in 2004 when I participated in a steelpan workshop at Caribbean Airlines Invaders Pan Yard.During that workshop I learnt how to play the Tenor and Guitar pans respectively. On my return back to school(Trinity Junior School) I began to play the National Anthem on the tenor pan during the morning assemblies.In 2008 I was encouraged to join the Starlift Junior Steel Orchestra.That journey afforded me some good learning experiences and learning how to better myself at playing my instrument.It also afforded me to an opportunity to study theory with the arranger Mr.Barry Mannette.I successfully attained a distinction in Grade I with the Royal School Of Music Theory Exams.Up to late last year i have earned up to my Grade IV.Last Year 2010 I traveled with the band to Montreal,Canada where we participated in the International Steelpan Festival.We took part in the Junior category and Senior category.We placed first in the junior competition and second in the seniors.This year 2011 we are at present preparing to return to Montreal to defend our title in the junior category.I have played in successive Junior Panorama competitions with the band from 2008- present as well as steelpan music festivals and also performances throughout Trinidad.Being a member of a Steel Orchestra has enhanced my interpersonal skills and my leadership skills as I was tenor section leader of the band.When I think about the tremendous benefits derived from this journey,I can only say thank God for this Steelpan Glory.